Jeppesen's electronic flight information service contract with Volaris Airlines will help the airline continue the transition from paper to digital flight navigation information. Jeppesen recently signed an electronic flight information service contract to provide tailored Jeppesen flight manuals and e-Link navigation solutions for Volaris Airlines, a leading low cost carrier based in Mexico. Jeppesen representatives traveled to Volaris Airlines headquarters during the negotiation process to meet with company officials and design unique solutions for the airline. The resulting agreement includes tailored charting applications with access to Jeppesen e-Link digital navigation services. 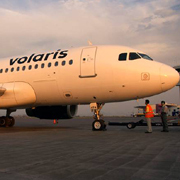 Volaris Airlines was launched in 2006 through a partnership of TACA Airlines and investment fund Discovery Americas. Today, Volaris Airlines operates more than 30 domestic routes with its fleet of Airbus 319 aircraft. Volaris Airlines entered the U.S. market this summer, a transition made easier through a code share agreement with Southwest Airlines. Uniquely, the airline offers service to the fastest growing cities in Mexico and provides convenient travel options for U.S.-bound travelers. Volaris Airlines also offers travelers an on-time flight guarantee, which includes refund options for a delay of more than 30 minutes. For more information on the industry-leading electronic charting solutions provided by Jeppesen, please visit our electronic charts and documents site. Volaris is a Mexican high-efficiency airline aimed at offering customers a unique travel experience – starting with the easy ticket purchasing process right through the On-Time Guarantee on all flights. With 21 Airbus A320 family aircrafts, Volaris has the youngest and most modern fleet in Mexico reaching 23 airports and 35 routes across the country. From the start of operations in March 2006, the airline guarantees travelers comfort and reliability delivered by more than 1,400 employees making up the Volaris family and dedicated to strengthening the airline’s commitment to excellent service and single-class treatment in a human way.